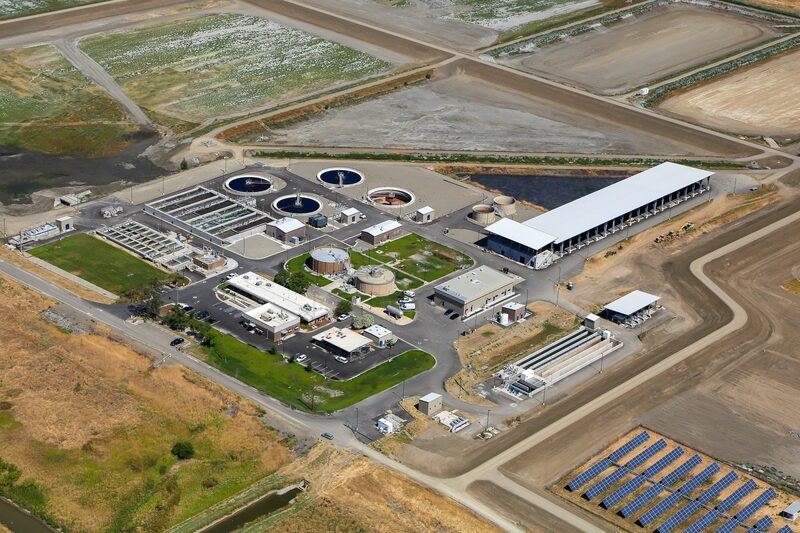 The Davis Wastewater Treatment Plant (WWTP) Secondary and Tertiary Improvements project in Davis, California has earned the Envision Silver Award for sustainable infrastructure. The Davis WWTP project involves the design and construction of improvements to the existing WWTP in order to meet State and Federal regulatory discharge requirements contained in the 2012 National Pollutant Discharge Elimination System (NPDES) permit. The project includes new secondary biological treatment, which is replacing the existing ponds and overland flow treatment system with an activated sludge process. The project also includes new tertiary filtration advanced treatment facilities, an upgraded disinfection system, ponds for flow equalization, system redundancy and allowances for future treatment capacity, new solids handling facilities, and remodeled operations, laboratory and maintenance facilities. West Yost Associates, AECOM/W.M. Lyles Joint Venture, Arcadis/Malcom Pirnie, and Covello Group worked in close collaboration with the City of Davis to deliver this award-winning, sustainable project. “The City of Davis is honored to receive the Envision Award for sustainable infrastructure improvements to our Wastewater Treatment Plant. Our project goals were to meet State and Federal regulatory discharge requirements as well as to plan sustainably for future growth and development while preserving and maintaining our wetlands. We are pleased that this project exceeded our expectations,” stated City of Davis Mayor, Brett Lee. “The AECOM/W.M. Lyles Joint Venture is proud to share the City of Davis’s commitment to sustainability by raising the standards for design and construction of critical infrastructure through innovative engineering and construction practices and to have helped achieve this prestigious award,“ said Scott Thibault, AECOM Vice President and Design-Build Manager for the City of Davis WWTP project. “West Yost Associates feels privileged to be part of a collaborative team focused on delivering a best-value project for the City’s ratepayers. The design-build project delivery process provided an opportunity for the City to work closely with engineering and construction experts to maintain consistency with the City’s values,” offered Jeff Pelz, West Yost Vice President and design-build Owner’s Advisor. The Envision sustainable infrastructure rating system assesses sustainability in five categories: Quality of Life, Leadership, Natural World, Resource Allocation, and Climate and Resilience. Consideration of these factors contributes positive social, economic, and environmental benefits to a community during the planning, design, and construction of infrastructure projects. 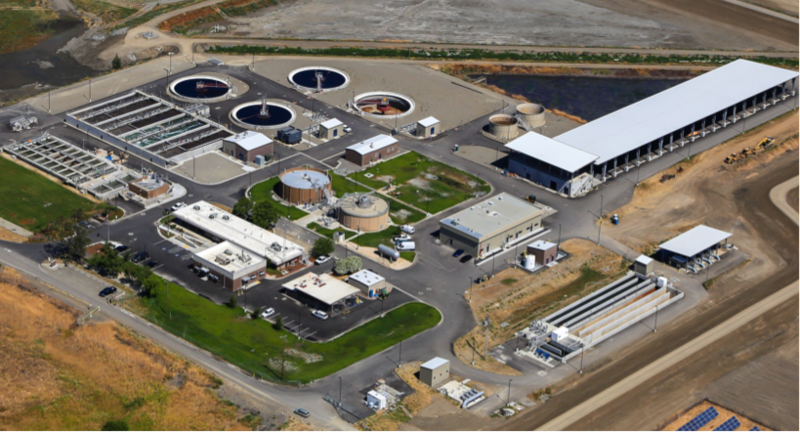 The upgraded Davis WWTP will contribute to sustainable growth by accommodating the City’s projected population changes while complying with increasingly stringent effluent discharge limits. The existing WWTP has historically discharged effluent to the Davis Wetlands, an important habitat for local waterfowl and a resource used by the local community for recreational purposes. These wetlands have provided additional treatment of the secondary effluent, which has in turn provided a much-needed source of water for waterfowl during the dry season. Upon completion of the upgraded WWTP, these wetlands will no longer be required for treatment, however the City is committed to preserving and maintaining the wetlands using the higher-quality tertiary effluent as a continuing source of water for the Davis Wetlands. As the WWTP is upgraded, much of the older equipment is being replaced by modern, high-technology, and energy efficient equipment that will achieve a much higher level of treatment. The WWTP’s solar panels, which produce approximately 1,740 megawatt hours (MWh) per year, are expected to provide approximately 65% of the post-upgrade energy demands of the facility. The City also installed continuous energy monitoring systems to allow early identification and action in case of dysfunction, and on a long-term basis, to provide information on energy efficiencies that may be used to optimize operations and reduce energy use. Accordingly, the City will conduct routine monitoring of the energy use data to identify potential malfunctions or abnormal energy use patterns throughout the WWTP. Replacing the original natural treatment processes with activated sludge and tertiary filtration significantly improves the quality of effluent discharged from the WWTP and therefore the local receiving waters. Improving effluent quality has positive benefits for downstream users, including local and regional habitats that rely on surface water. A comprehensive sustainability management system was implemented during the planning, design, and construction of this project, commensurate with the project’s scope, scale, and complexity. The sustainability management system covered the various sustainability features of the project and how these features align with the City’s sustainability goals and with the needs of the stakeholders affected by the project. As a key feature of the sustainability management system, the City’s request for design-build proposals required the competing teams to identify specific aspects of their proposed design and construction activities that would achieve sustainability goals. The selected design-build team was then responsible for achieving a substantial number of points considered during the Envision verification process.